Celebrate a confident confidant with Sarah Janece Garcia's bold portrait of the rooster. Up with the sun and ready rouse the world, the rooster is an inspiration with its charming and self-assured attitude. Named Fidencio—a name derived from Spanish meaning "confidence"—Sarah Janece Garcia's painting was motivated by this confident creature. Not just splendid with its shining plumage, roosters are also fiercely protective, and will perch above a group of birds to guard their kin and sound a distinct alarm call. The artist captures her appreciation for this unmistakable bird's boldness and bravery through this brilliantly hued portrait. Made in Dallas, Texas. Printed and framed in Portland, Oregon. 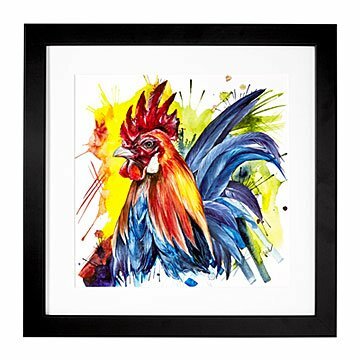 Beautiful painting captures the spirit of roosters.